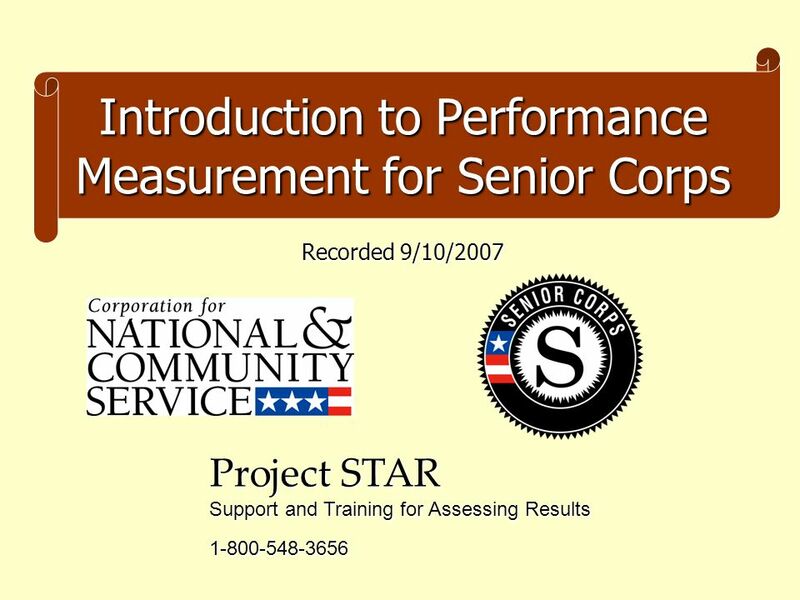 Introduction to Performance Measurement for Senior Corps Project STAR Support and Training for Assessing Results 1-800-548-3656 Recorded 9/10/2007. 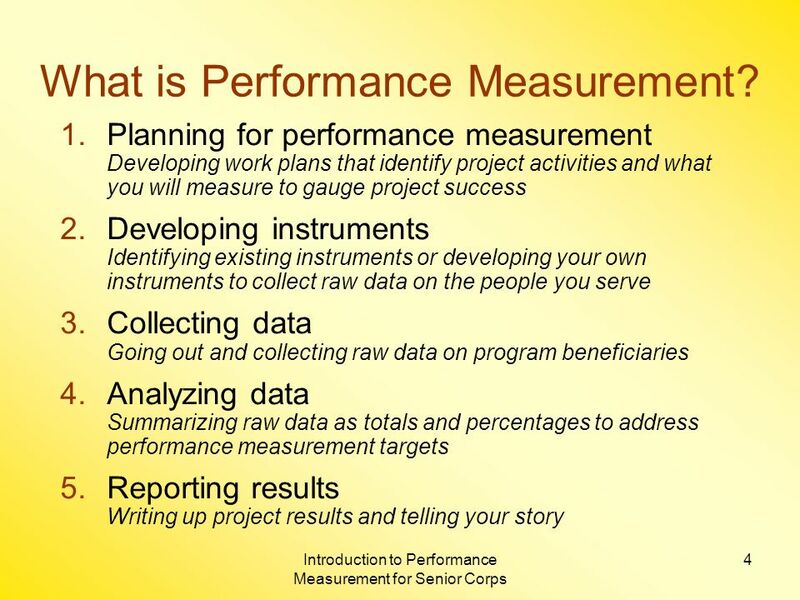 3 Introduction to Performance Measurement for Senior Corps 3 What is Performance Measurement? 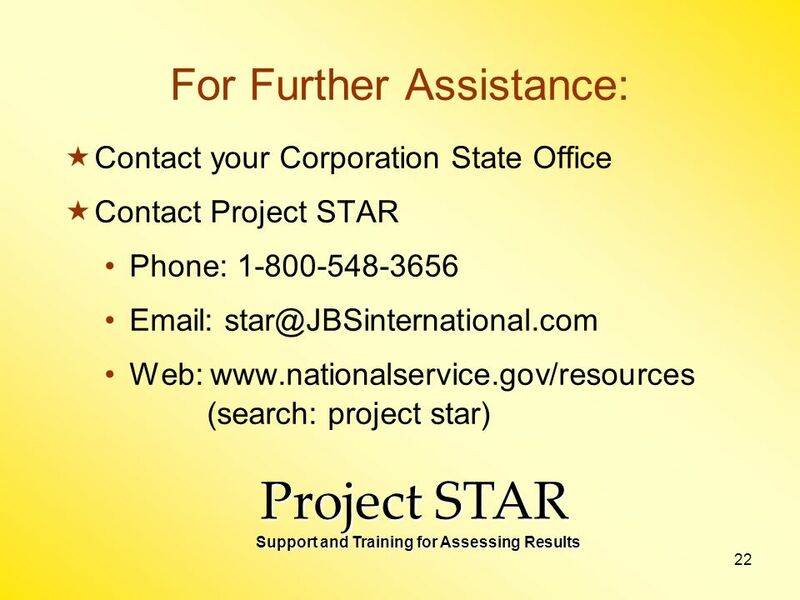 Process of regularly measuring the results produced by your project. 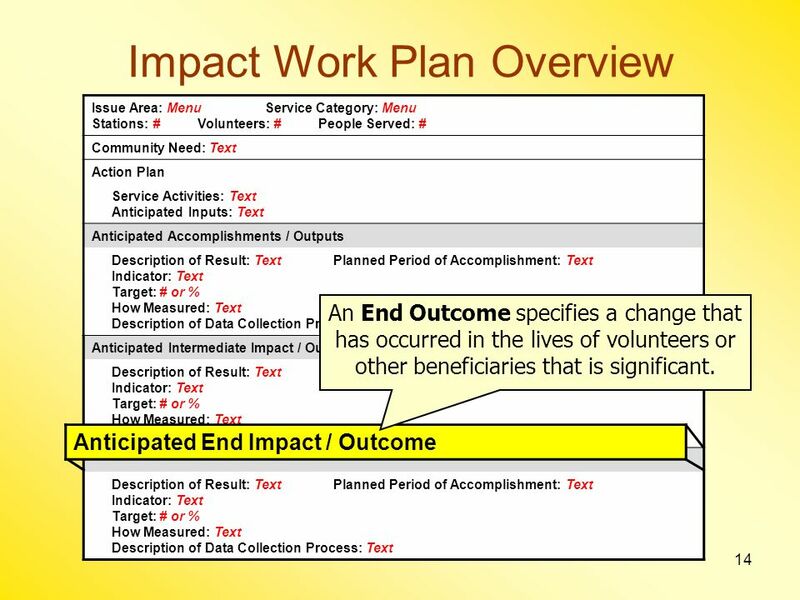 Performance measurement allows you to track the amount of work done by your project (outputs) and the impact of this work on the people your volunteers serve (outcomes). 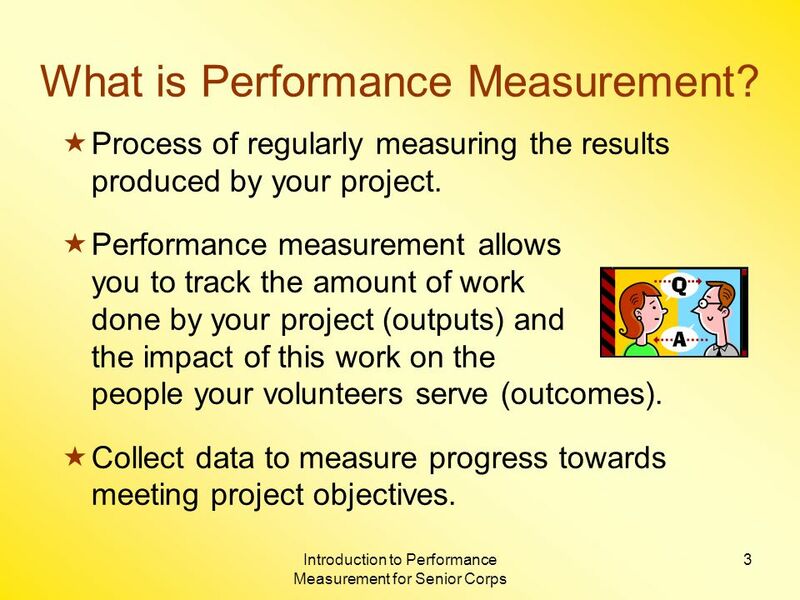 Collect data to measure progress towards meeting project objectives. 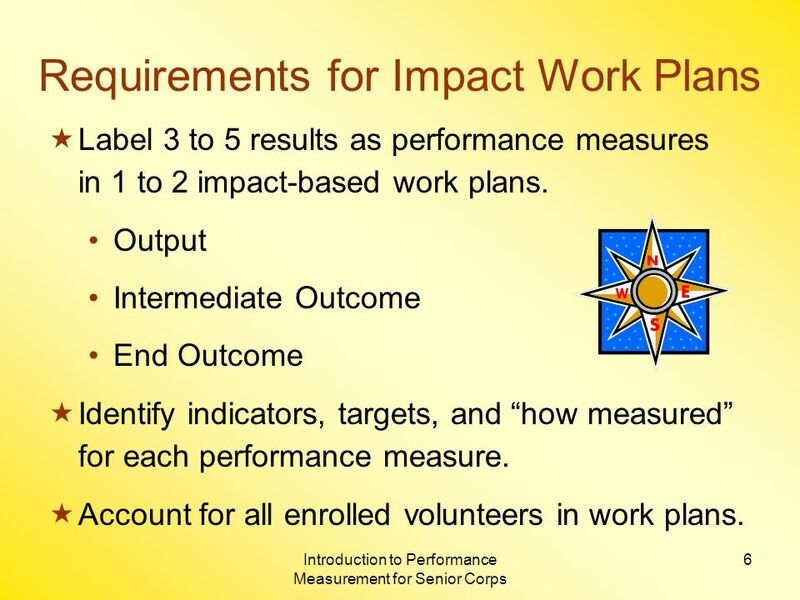 6 Introduction to Performance Measurement for Senior Corps 6 Requirements for Impact Work Plans Label 3 to 5 results as performance measures in 1 to 2 impact-based work plans. 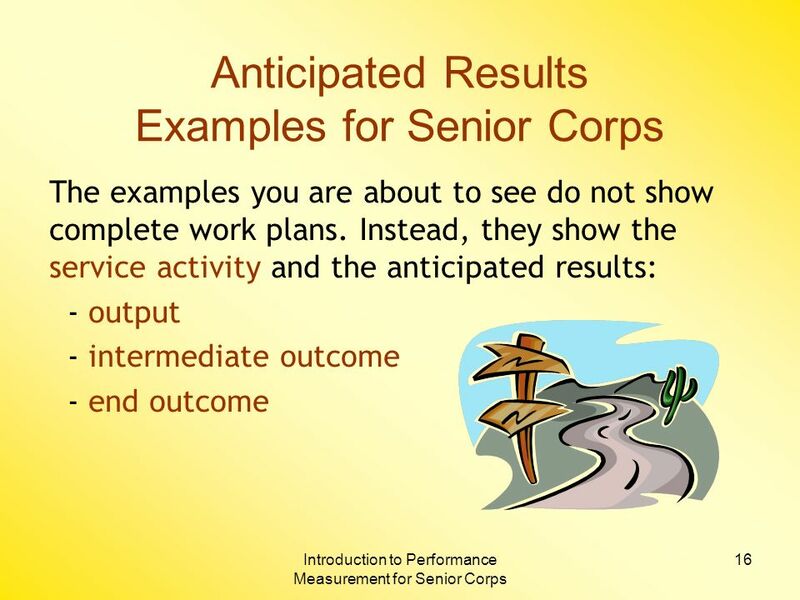 Output Intermediate Outcome End Outcome Identify indicators, targets, and how measured for each performance measure. 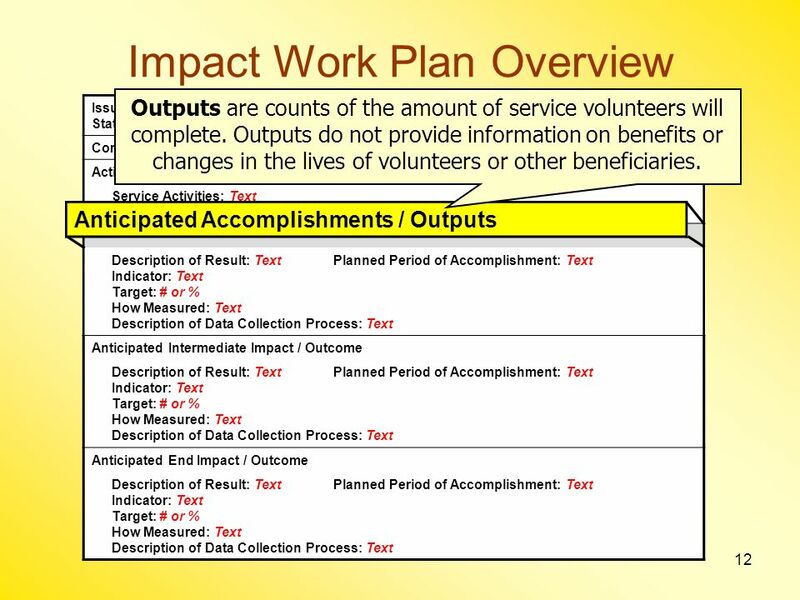 Account for all enrolled volunteers in work plans. 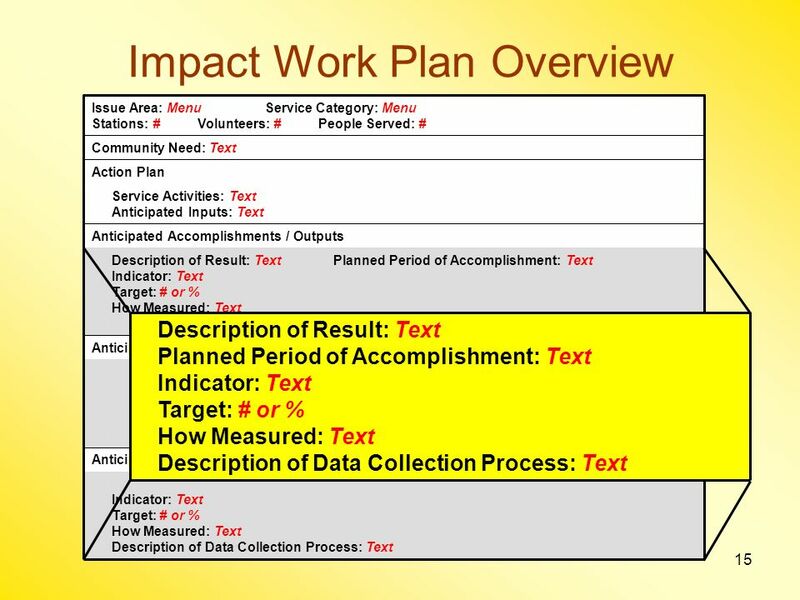 8 8 Impact Work Plan Overview Description of Result: Text Planned Period of Accomplishment: Text Indicator: Text Target: # or % How Measured: Text Description of Data Collection Process: Text Anticipated End Impact / Outcome Description of Result: Text Planned Period of Accomplishment: Text Indicator: Text Target: # or % How Measured: Text Description of Data Collection Process: Text Anticipated Intermediate Impact / Outcome Description of Result: Text Planned Period of Accomplishment: Text Indicator: Text Target: # or % How Measured: Text Description of Data Collection Process: Text Anticipated Accomplishments / Outputs Service Activities: Text Anticipated Inputs: Text Action Plan Issue Area: Menu Service Category: Menu Stations: # Volunteers: # People Served: # Select issue area and service category from drop-down menus. 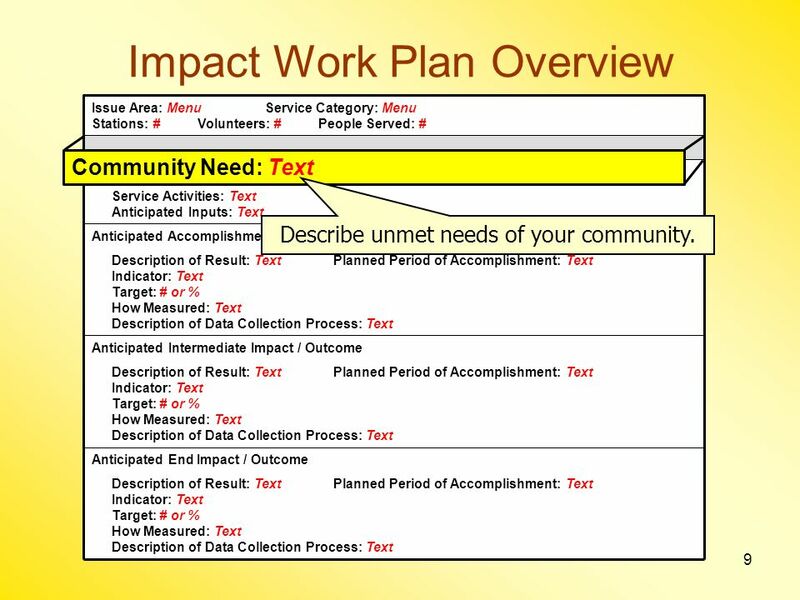 9 9 Impact Work Plan Overview Description of Result: Text Planned Period of Accomplishment: Text Indicator: Text Target: # or % How Measured: Text Description of Data Collection Process: Text Anticipated End Impact / Outcome Description of Result: Text Planned Period of Accomplishment: Text Indicator: Text Target: # or % How Measured: Text Description of Data Collection Process: Text Anticipated Intermediate Impact / Outcome Description of Result: Text Planned Period of Accomplishment: Text Indicator: Text Target: # or % How Measured: Text Description of Data Collection Process: Text Anticipated Accomplishments / Outputs Service Activities: Text Anticipated Inputs: Text Issue Area: Menu Service Category: Menu Stations: # Volunteers: # People Served: # Community Need: Text Describe unmet needs of your community. 10 10 Target: # or % How Measured: Text Description of Data Collection Process: Text Impact Work Plan Overview Description of Result: Text Planned Period of Accomplishment: Text Indicator: Text Target: # or % How Measured: Text Description of Data Collection Process: Text Anticipated End Impact / Outcome Description of Result: Text Planned Period of Accomplishment: Text Indicator: Text Target: # or % How Measured: Text Description of Data Collection Process: Text Anticipated Intermediate Impact / Outcome Anticipated Accomplishments / Outputs Action Plan Community Need: Text Issue Area: Menu Service Category: Menu Stations: # Volunteers: # People Served: # Service Activities: Text Anticipated Inputs: Text Action Plan Describe what your Senior Corps volunteers will do (who, what, where, when, how). 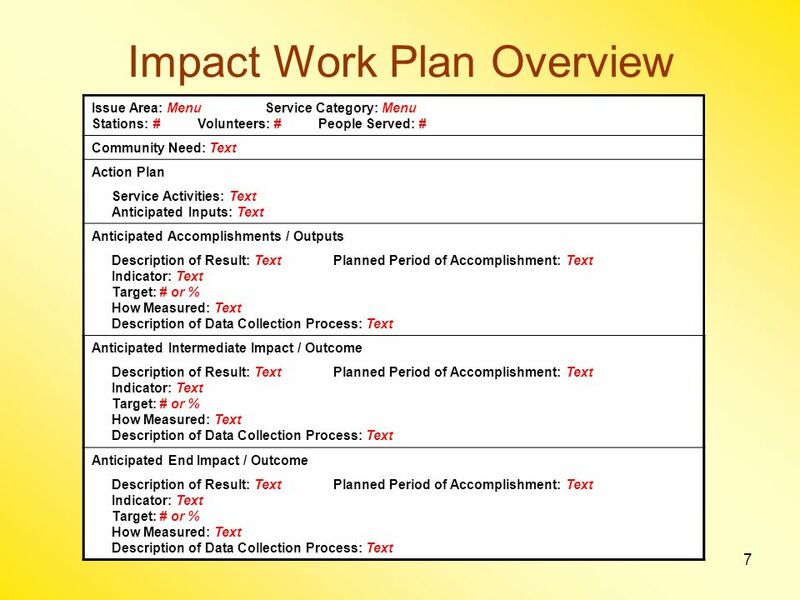 11 11 Target: # or % How Measured: Text Description of Data Collection Process: Text Impact Work Plan Overview Description of Result: Text Planned Period of Accomplishment: Text Indicator: Text Target: # or % How Measured: Text Description of Data Collection Process: Text Anticipated End Impact / Outcome Description of Result: Text Planned Period of Accomplishment: Text Indicator: Text Target: # or % How Measured: Text Description of Data Collection Process: Text Anticipated Intermediate Impact / Outcome Anticipated Accomplishments / Outputs Action Plan Community Need: Text Issue Area: Menu Service Category: Menu Stations: # Volunteers: # People Served: # Service Activities: Text Anticipated Inputs: Text Action Plan Resources used in service effort: volunteer hours, training, stipends, etc. 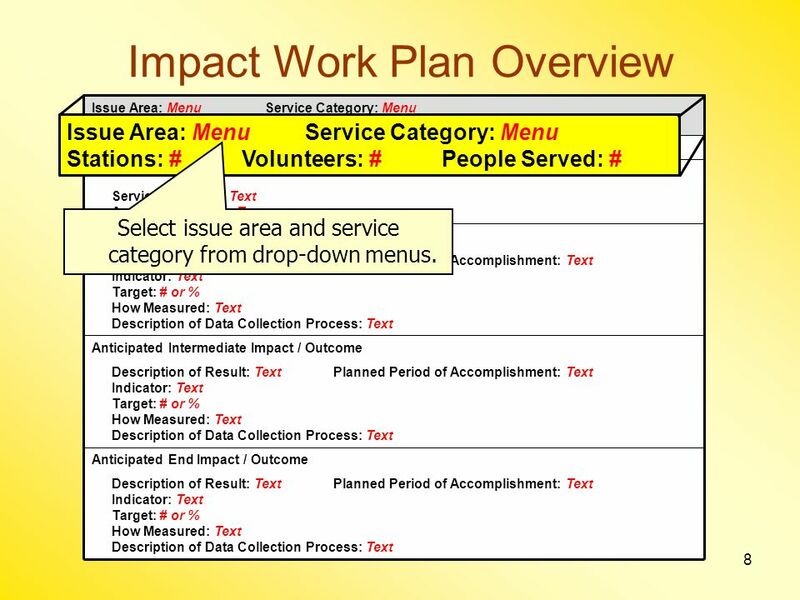 12 12 Impact Work Plan Overview Issue Area: Menu Service Category: Menu Stations: # Volunteers: # People Served: # Community Need: Text Action Plan Service Activities: Text Anticipated Inputs: Text Anticipated Accomplishments / Outputs Description of Result: Text Planned Period of Accomplishment: Text Indicator: Text Target: # or % How Measured: Text Description of Data Collection Process: Text Anticipated Intermediate Impact / Outcome Description of Result: Text Planned Period of Accomplishment: Text Indicator: Text Target: # or % How Measured: Text Description of Data Collection Process: Text Anticipated End Impact / Outcome Description of Result: Text Planned Period of Accomplishment: Text Indicator: Text Target: # or % How Measured: Text Description of Data Collection Process: Text Anticipated Accomplishments / Outputs Outputs are counts of the amount of service volunteers will complete. 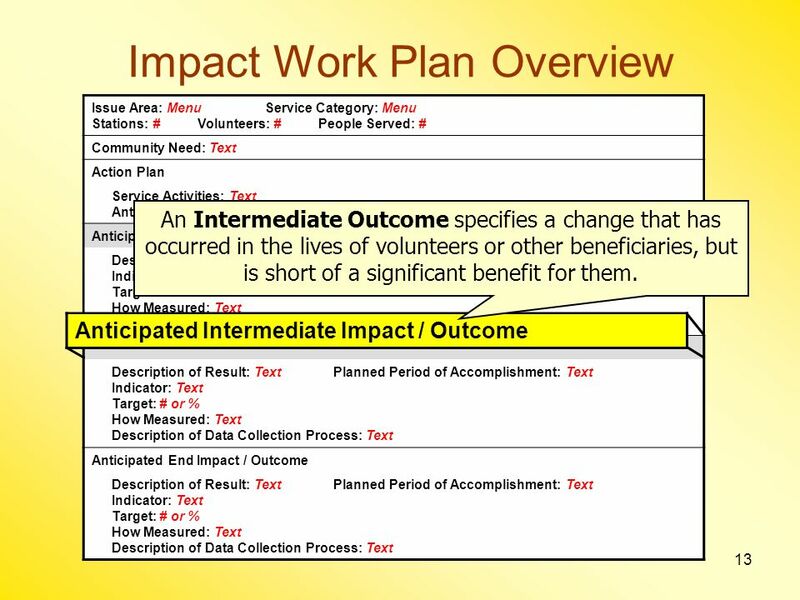 Outputs do not provide information on benefits or changes in the lives of volunteers or other beneficiaries. 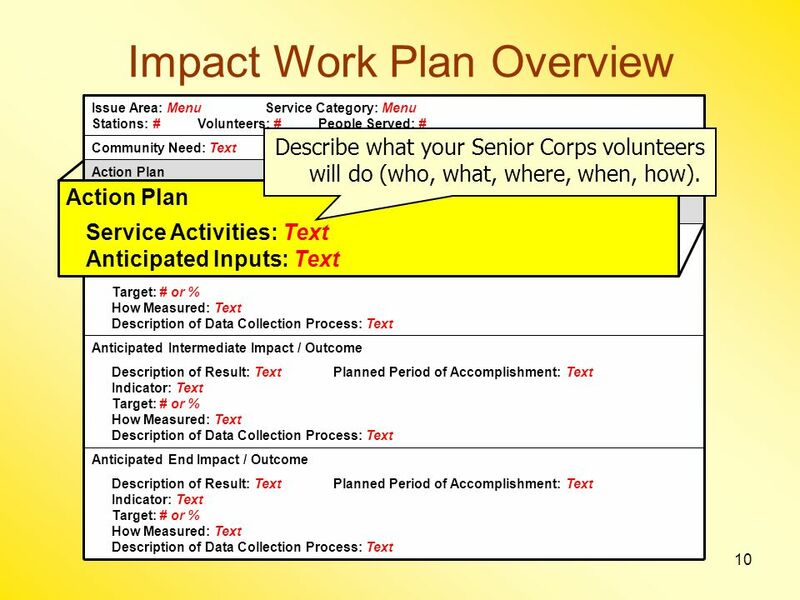 13 13 Impact Work Plan Overview Issue Area: Menu Service Category: Menu Stations: # Volunteers: # People Served: # Community Need: Text Action Plan Service Activities: Text Anticipated Inputs: Text Anticipated Accomplishments / Outputs Description of Result: Text Planned Period of Accomplishment: Text Indicator: Text Target: # or % How Measured: Text Description of Data Collection Process: Text Anticipated Intermediate Impact / Outcome Description of Result: Text Planned Period of Accomplishment: Text Indicator: Text Target: # or % How Measured: Text Description of Data Collection Process: Text Anticipated End Impact / Outcome Description of Result: Text Planned Period of Accomplishment: Text Indicator: Text Target: # or % How Measured: Text Description of Data Collection Process: Text Anticipated Intermediate Impact / Outcome An Intermediate Outcome specifies a change that has occurred in the lives of volunteers or other beneficiaries, but is short of a significant benefit for them. 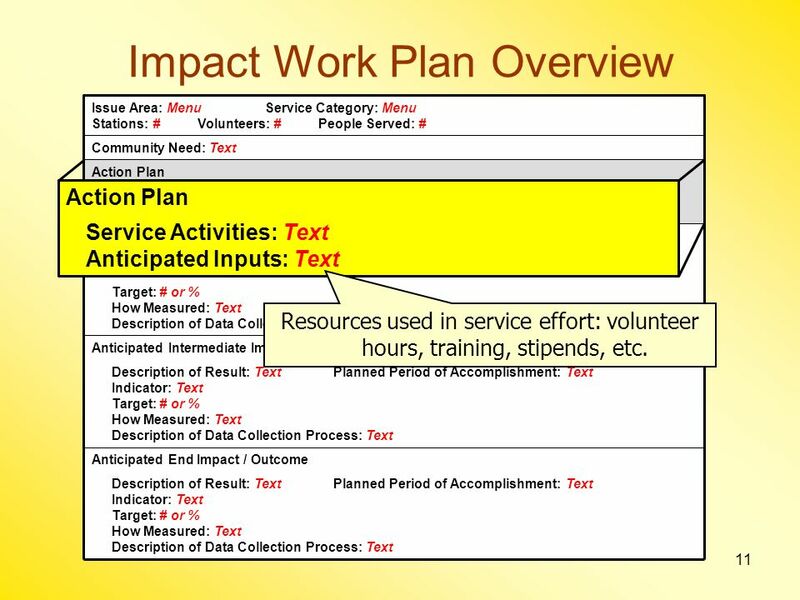 14 14 Impact Work Plan Overview Issue Area: Menu Service Category: Menu Stations: # Volunteers: # People Served: # Community Need: Text Action Plan Service Activities: Text Anticipated Inputs: Text Anticipated Accomplishments / Outputs Description of Result: Text Planned Period of Accomplishment: Text Indicator: Text Target: # or % How Measured: Text Description of Data Collection Process: Text Anticipated Intermediate Impact / Outcome Description of Result: Text Planned Period of Accomplishment: Text Indicator: Text Target: # or % How Measured: Text Description of Data Collection Process: Text Anticipated End Impact / Outcome Description of Result: Text Planned Period of Accomplishment: Text Indicator: Text Target: # or % How Measured: Text Description of Data Collection Process: Text Anticipated End Impact / Outcome An End Outcome specifies a change that has occurred in the lives of volunteers or other beneficiaries that is significant. 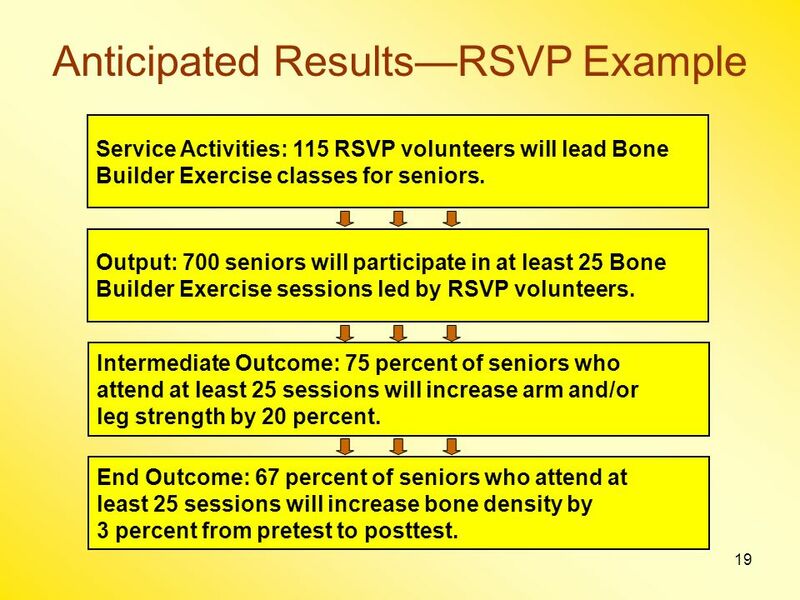 19 19 Anticipated ResultsRSVP Example Service Activities: 115 RSVP volunteers will lead Bone Builder Exercise classes for seniors. Intermediate Outcome: 75 percent of seniors who attend at least 25 sessions will increase arm and/or leg strength by 20 percent. Output: 700 seniors will participate in at least 25 Bone Builder Exercise sessions led by RSVP volunteers. End Outcome: 67 percent of seniors who attend at least 25 sessions will increase bone density by 3 percent from pretest to posttest. 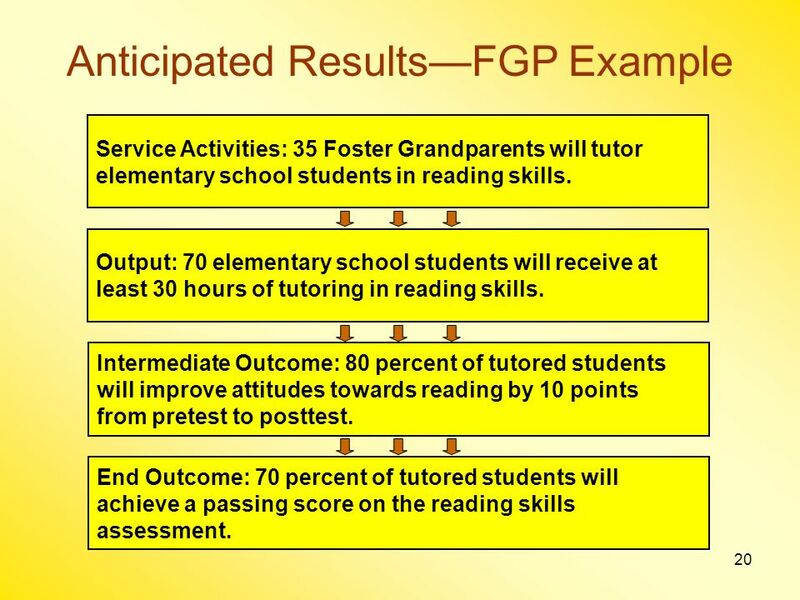 20 20 Anticipated ResultsFGP Example Service Activities: 35 Foster Grandparents will tutor elementary school students in reading skills. Intermediate Outcome: 80 percent of tutored students will improve attitudes towards reading by 10 points from pretest to posttest. Output: 70 elementary school students will receive at least 30 hours of tutoring in reading skills. End Outcome: 70 percent of tutored students will achieve a passing score on the reading skills assessment. 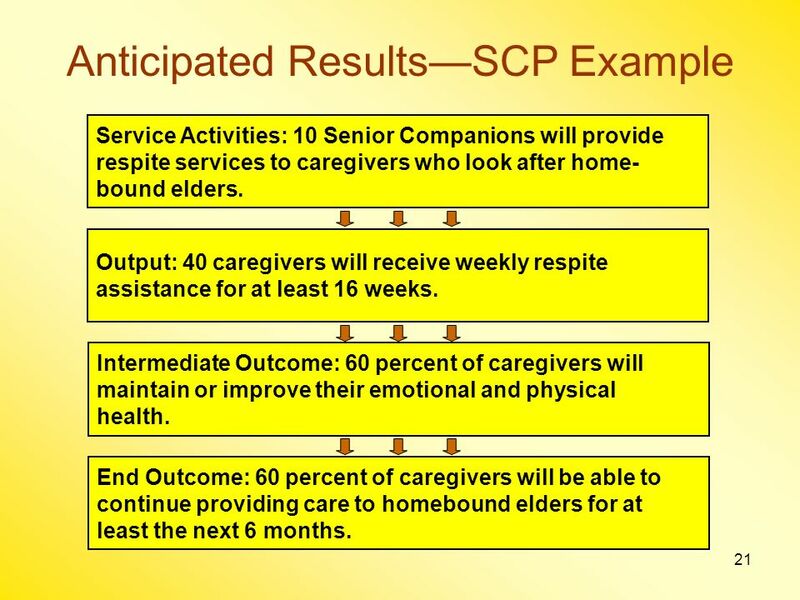 21 21 Anticipated ResultsSCP Example Service Activities: 10 Senior Companions will provide respite services to caregivers who look after home- bound elders. 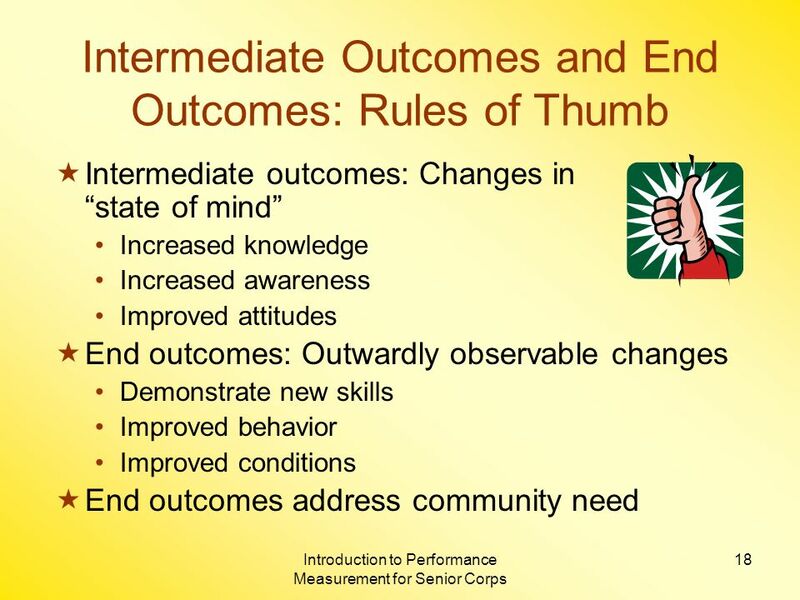 Intermediate Outcome: 60 percent of caregivers will maintain or improve their emotional and physical health. Output: 40 caregivers will receive weekly respite assistance for at least 16 weeks. End Outcome: 60 percent of caregivers will be able to continue providing care to homebound elders for at least the next 6 months. 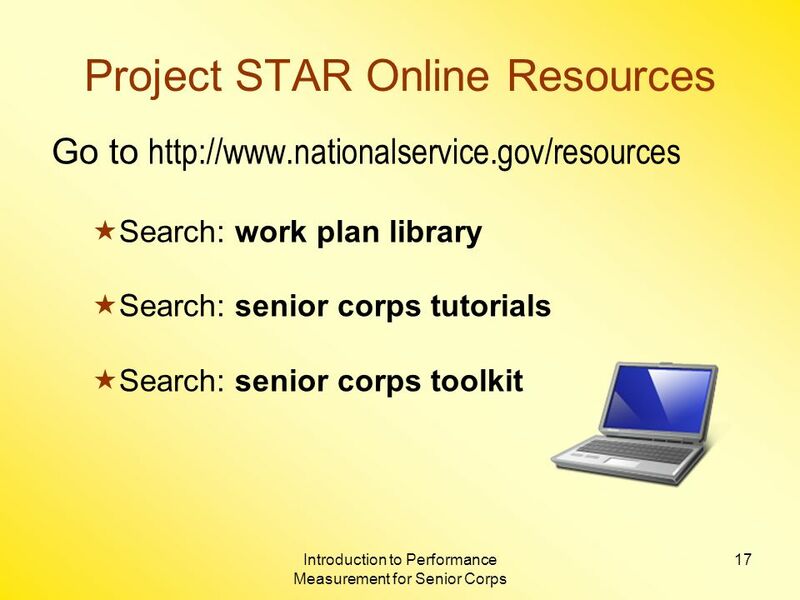 Download ppt "Introduction to Performance Measurement for Senior Corps Project STAR Support and Training for Assessing Results 1-800-548-3656 Recorded 9/10/2007." 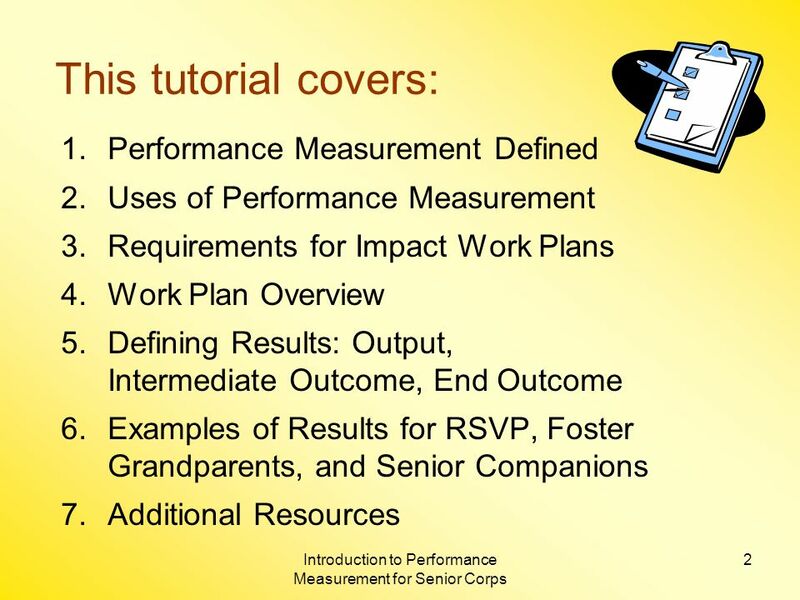 Performance Measurement: Not just for breakfast anymore Performance Measurement and the Strategic Plan Senior Corps Virtual Conference August 2012. 1 Managing to Outcomes Creating a Result-Driven Culture September 15, 2010 Jewel Bazilio-Bellegarde, CNCS Ken Terao and Anna Marie Schmidt, Project STAR. 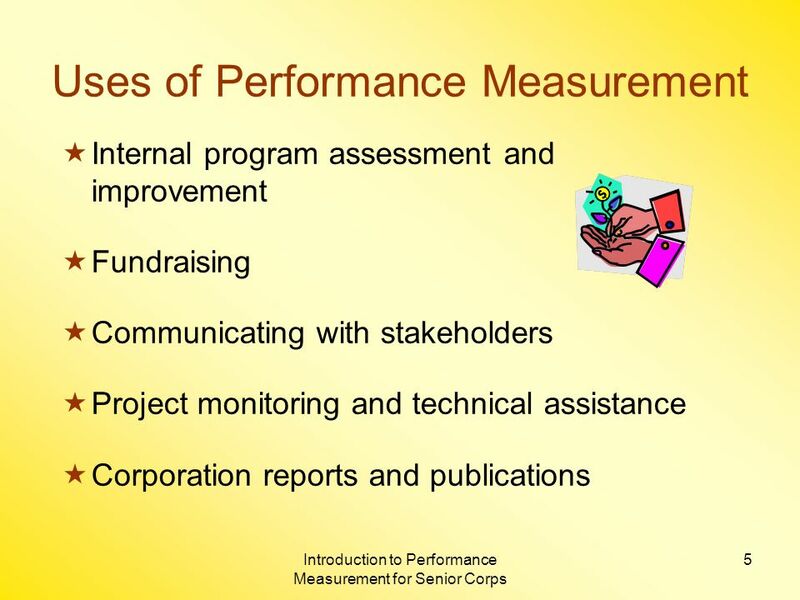 An overview of the National Performance Measures 118 NOVEMBER 2011 THE CORPORATION OF NATIONAL & COMMUNITY SERVICE.